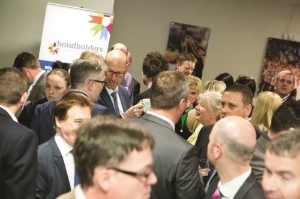 Holy Trinity is delighted to announce that it has joined Hull’s rapidly-growing business network, The Bondholders. Almost 250 businesses and organisations are now part of the scheme, working together to raise the profile of Hull and the Humber. Every member of The Bondholder makes a difference by making a financial contribution to the promotion of the area, as well as acting as an ambassador for the region. The network works with partners, including the Humber Local Enterprise Partnership, to market the region to key external audiences, including investors and high-level decision-makers, to encourage investment and job-creation. The Vicar of Holy Trinity, the Rev Canon Dr Neal Barnes said: "Joining the Bondholders reflects our commitment to Holy Trinity playing an important part in the life of the city and wider region. "We share the Bondholders' passion for promoting Hull and bringing investment into the area. We also have exciting plans to make our own contribution to Hull's regeneration and look forward to working with fellow Bondholders members to take our great city even further forward." Activity led by the Bondholders has included branding the Humber as the UK’s Energy Estuary and producing aspirational recruitment materials to assist member companies to bring talent to the region.